I have not seen this brand charger before. It can charger both LiIon and NiMH and uses two different currents, depending on battery size. I got the charger in a white cardboard box. Contents was charger, mains cable and a car adapter. No instruction sheet or manual was included (It is not really needed with this type of charger). 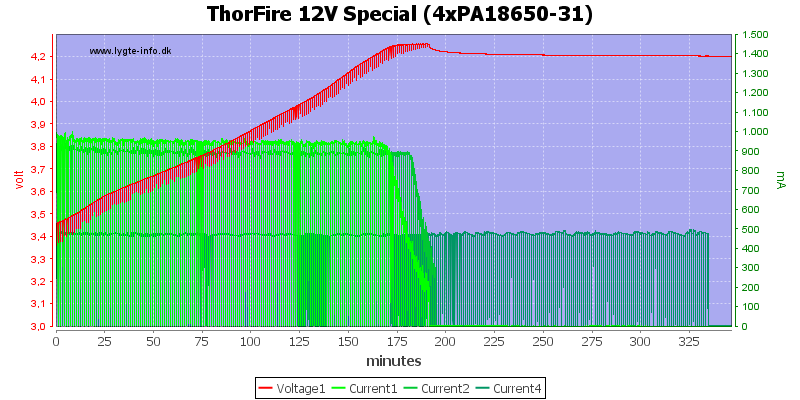 The charger is powered from either 110/220 VAC 50/60Hz or 12 VDC. The charger has a simple display that shows voltage for each slot and a animated bar when charging. The blue background light is on when the charger is powered. 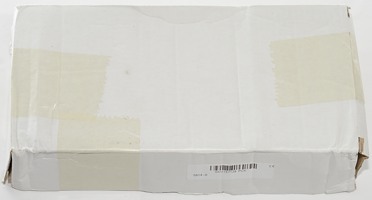 The label on the front has all the specifications. 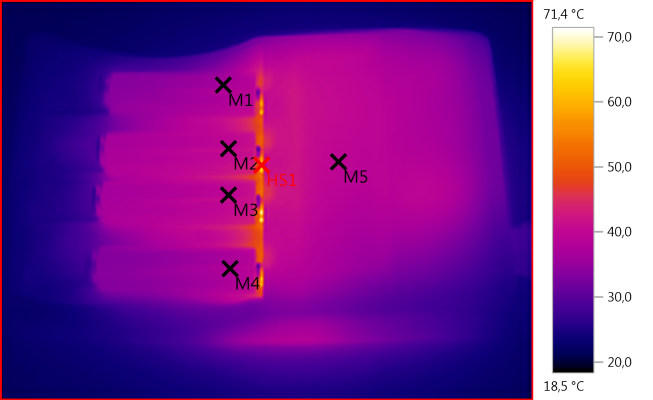 Note: C cells do not fit into the charger, they will not connect to the positive pole. 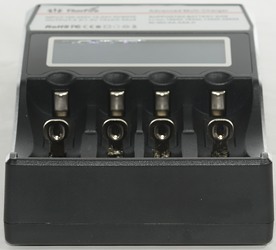 The charger will select between 1A and 0.5A charge current, depending on battery length. The 1A current is select when the battery is 65mm or longer. There is a slight problem with this, see below. The sliders works fine and can handle from 30 mm to 71mm long batteries. 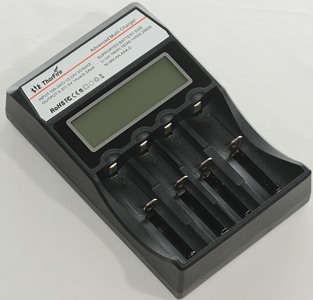 The charger can handle 71 mm long batteries, including flat top cells. 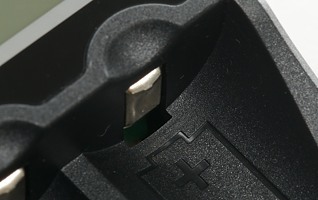 With C cells there can be a problem, due to the small button top, they will slide up over the plus connection. 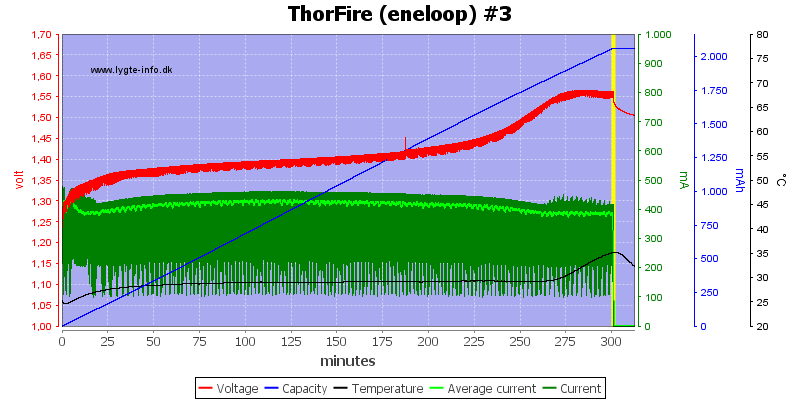 When not connected to power it will drain about 0.2mA from LiIon batteries. 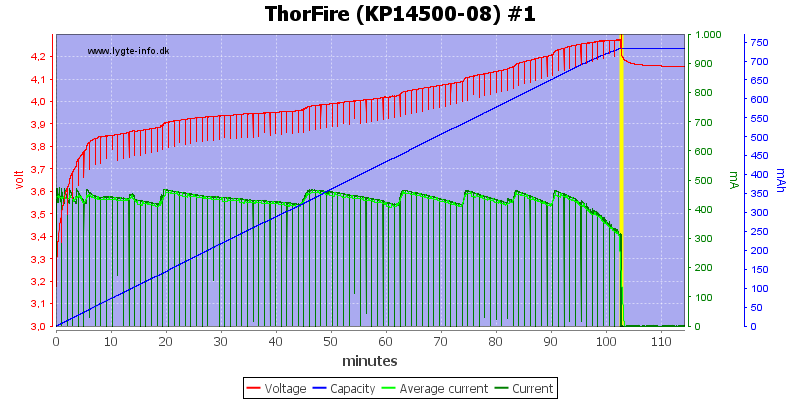 Voltmeter will only change reading slowly. 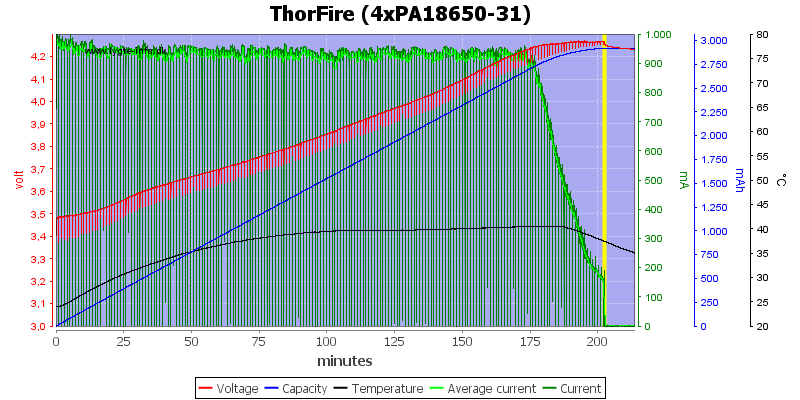 When charging NiMH the voltage will not show more than 1.5 volt. When charging NiMH the voltage will not show more than 4.2 volt. Above 2.2 volt the charger assumes LiIon. Charge will start will full charge current at 0 volt. 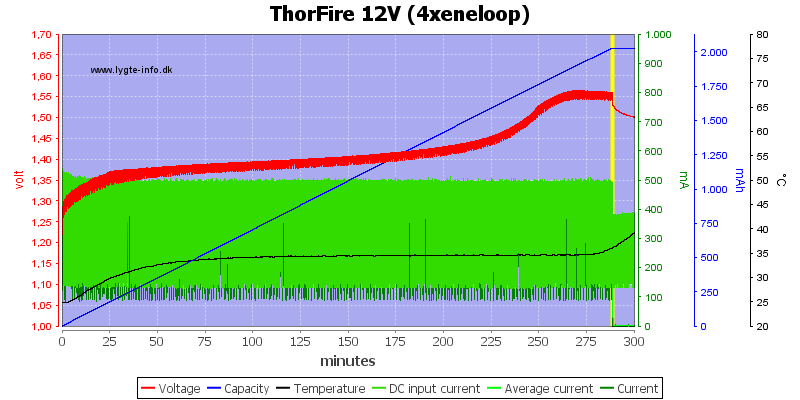 The charger uses a simulated CC/CV charging with a too high charger voltage (About 4.27 volt on this channel). 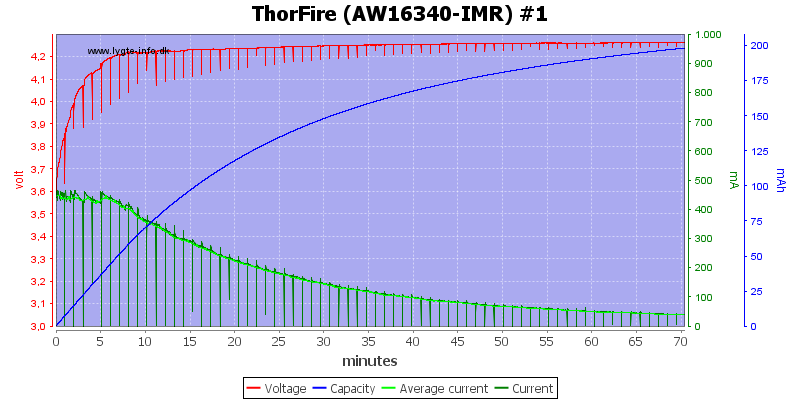 The termination current is also a bit high (For a 18650 a good value is between 50 and 100mA). This channel has even higher charge voltage. The two last channels does also have to high charge voltage. 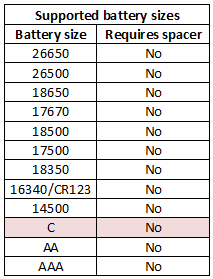 The two other battery capacities are also charged with too high voltage, due to its age the 2600mAh cell drops to 4.20 volt when the charge is terminated. This cell is shorter than 65mm and is only charged with 0.5A, again the voltage is a bit to high. PS: My logging terminated early and I do not see any reason to redo it. For some unknown reason this cell is charged correctly. 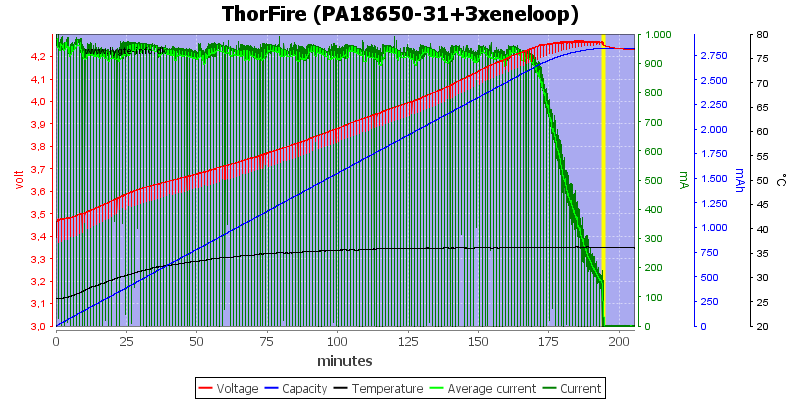 But here it goes wrong again, both too high voltage and too high termination current. 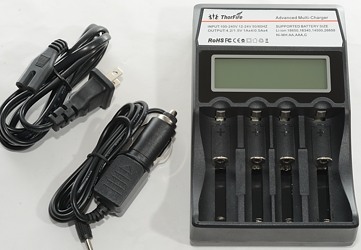 The charger will use full current with 4 batteries (If they are long enough). 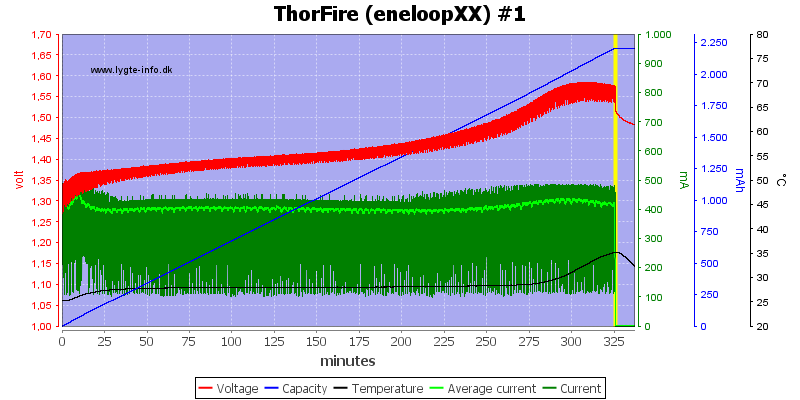 The charger uses around 1300mA from the 12V input to charge 4 cells. 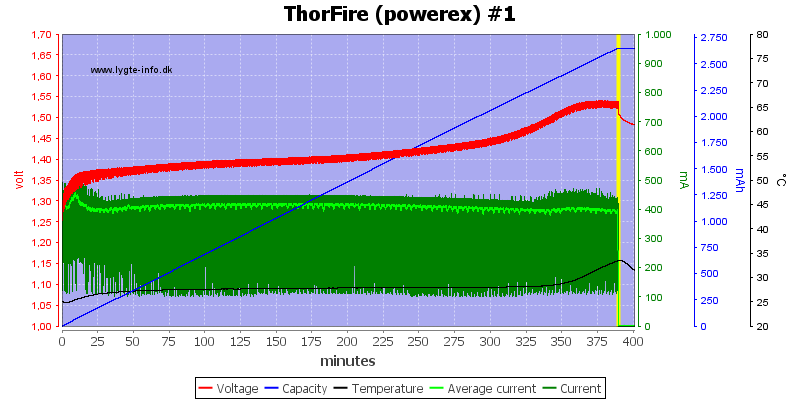 That is about 15.6 watt and charge power is about 16.8 watt, something is wrong. 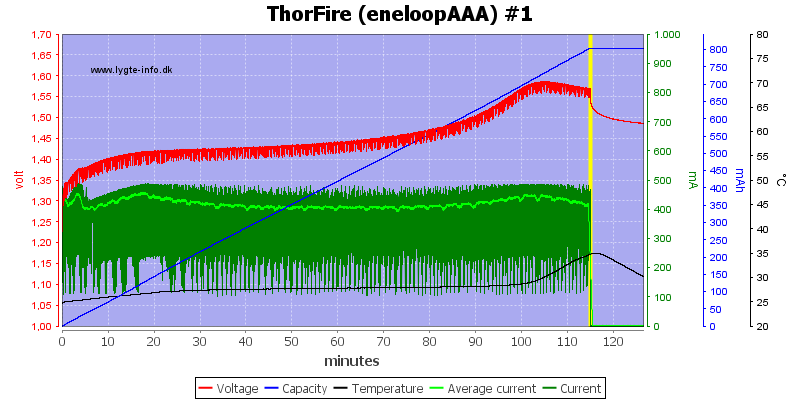 Adding current sensors to more cells reveals what is going on: Not all cells are charged with full current! 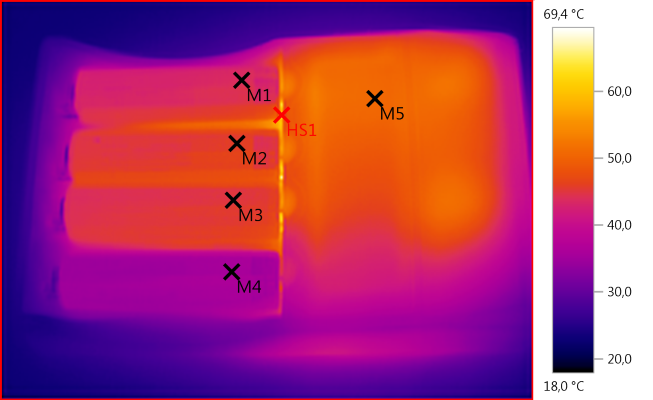 The actual problem is the current sense spring, because the change point is at about 65mm it will not always change to 1A current with 65mm long cells. A change point of 63mm or 64mm would have been better (It can easy be fixed by streching the spring). 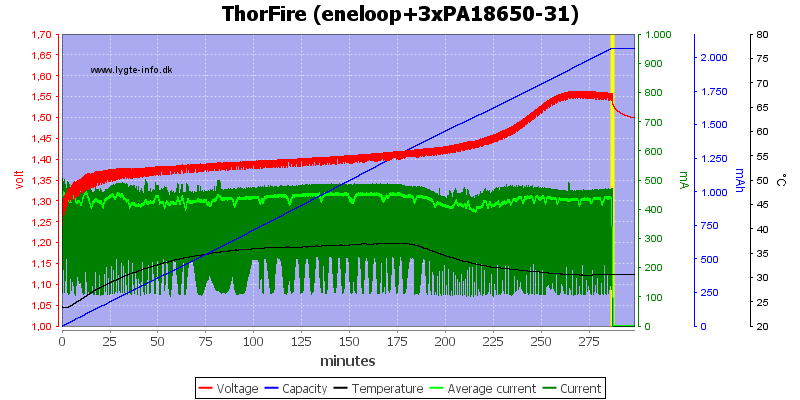 The batteries do get rather warm. 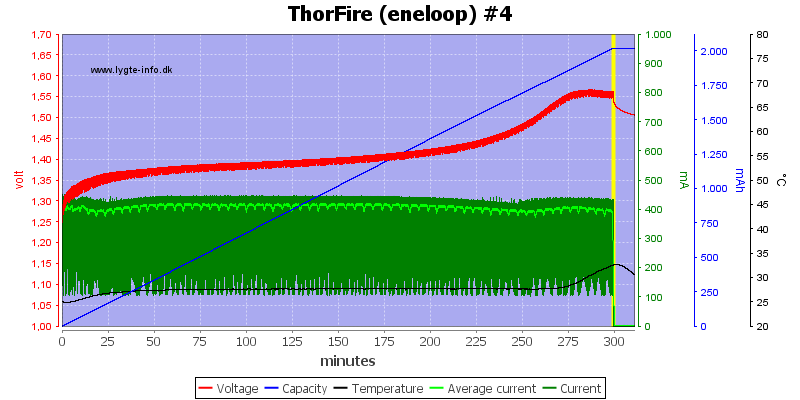 Notice that channel #4 is coolor on this photo, probably because it is charging with a lower current. The measurement checks are only done once a minute, this is the reason for the slow display update speed. 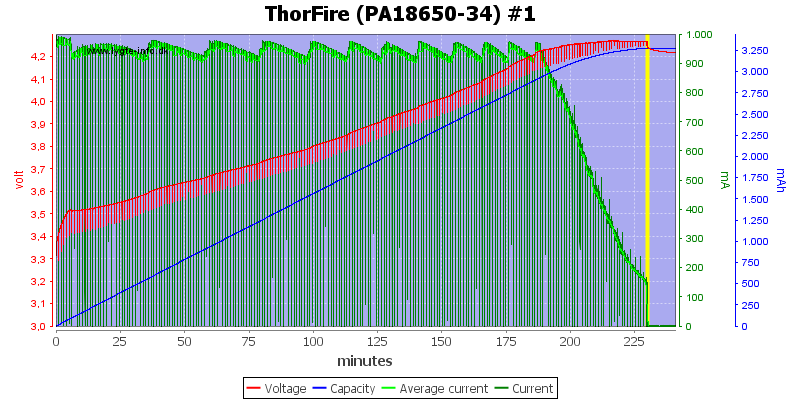 The low current is done by reducing the current, not any type of pwm (Good). This looks like a good -dv/dt charg for NiMH. Same with the other channels. 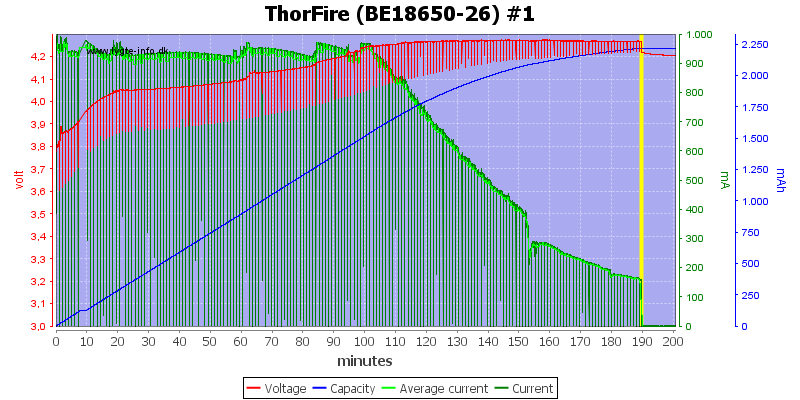 Same with the 2500mAh batteries. 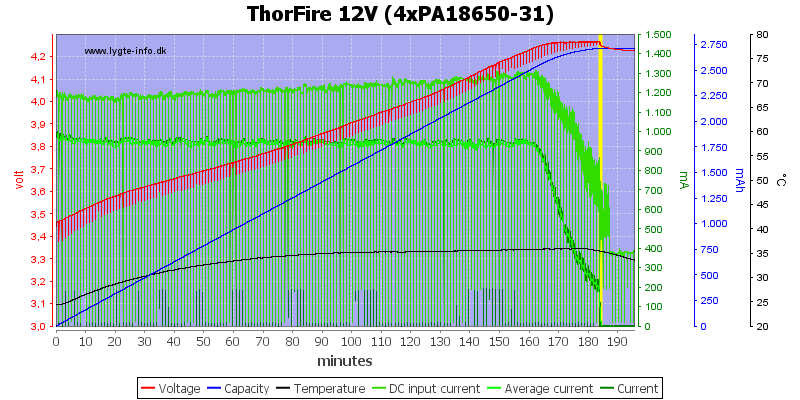 With -dv/dt termination it can be slow to detect a full battery and the ThorFire is very slow at that. Current is the same with 4 batteries. 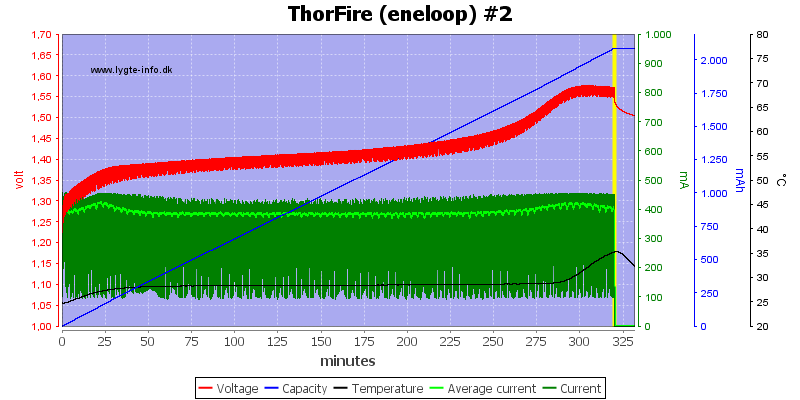 Note: Temperature sensor is not on the same battery as voltage and current sensors. 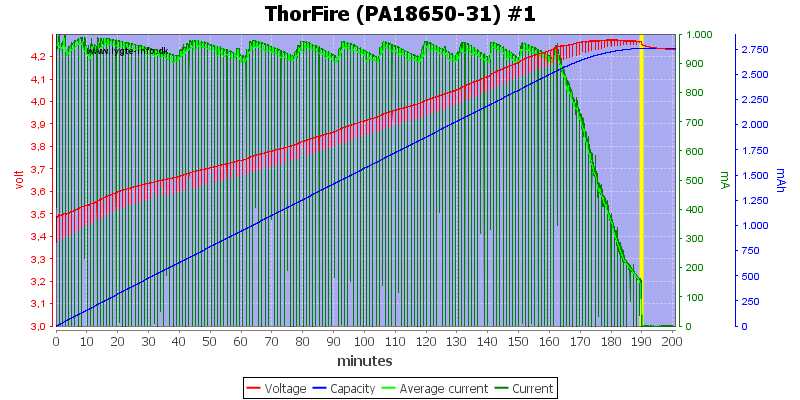 The charger needs about 0.5A from a 12V power supply to charger 4 NiMH batteries. 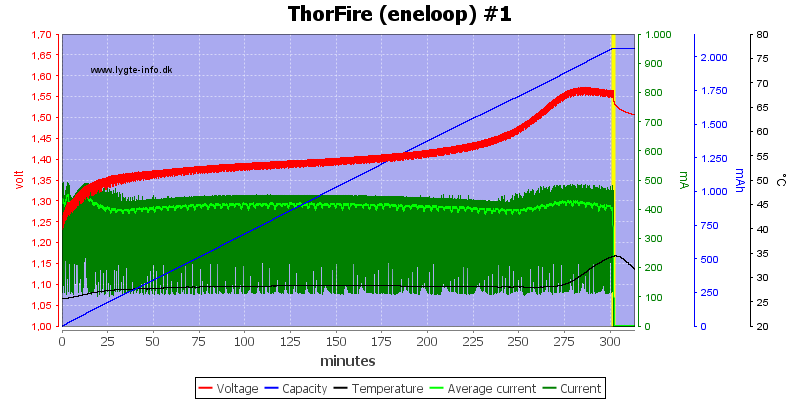 The charger gets rather warm inside, but the batteries has an acceptable temperature. Also NiMH has a fast startup. 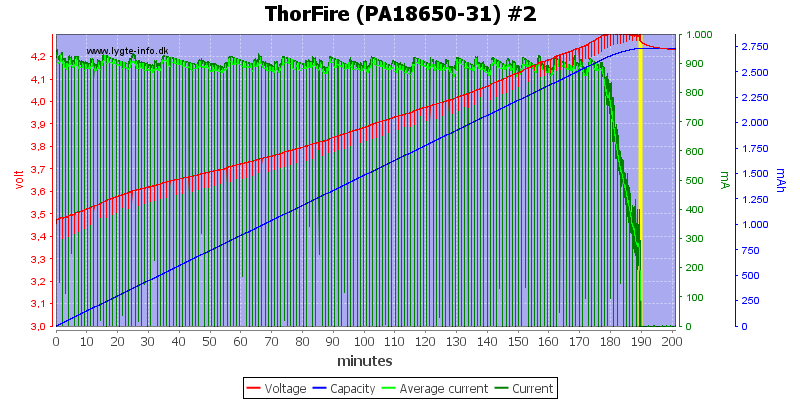 Here the voltage sense is much more frequent. 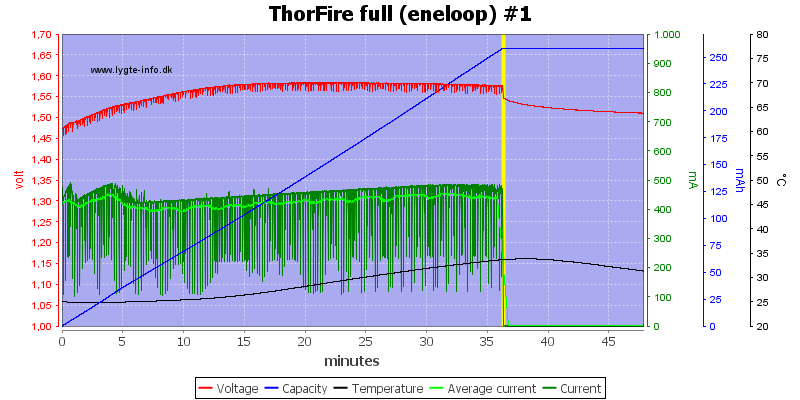 Note: The temperature sensor is on another battery than the current and voltage sensors. 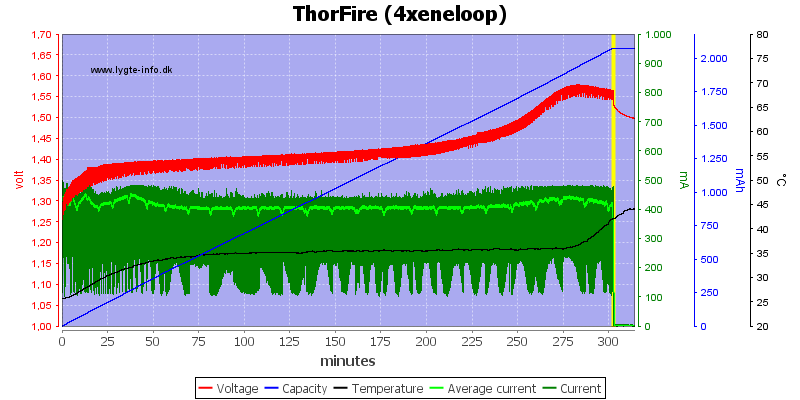 No surprise here, the usual CC/CV curve with slightly to high voltage. 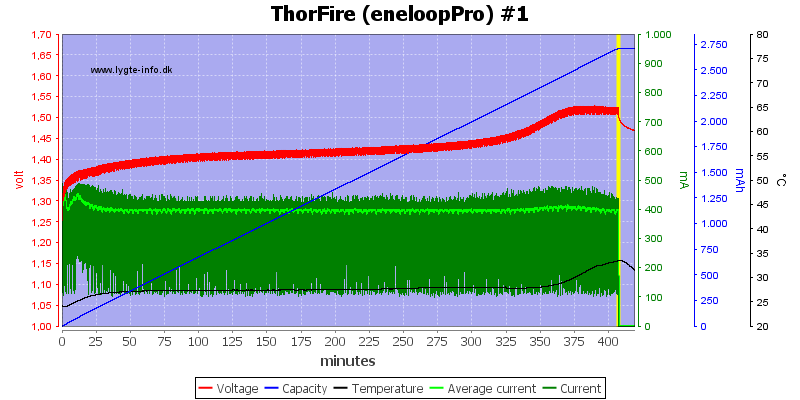 The eneloop also looks good. The LiIon finish first and the temperature drops. For LiIon the charger uses CC/CV as it is supposed to, but with to high charge voltage and to high termination current it is not very good. 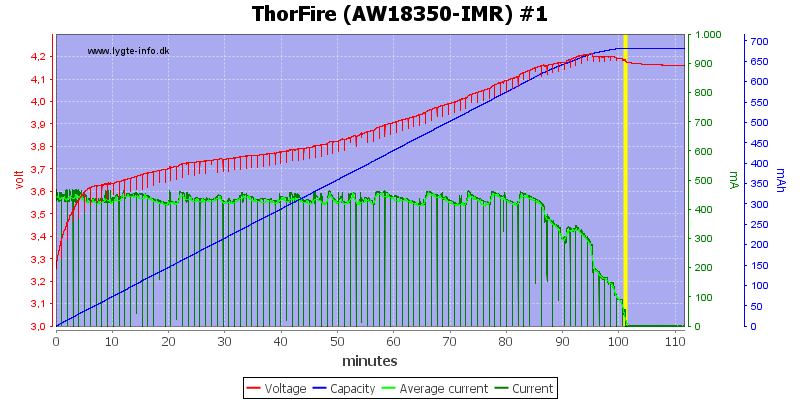 NiMH works much better, the charger is good at termination when the batteries are full and there is no trickle charging, but I could have wished for a faster detection of a full battery. 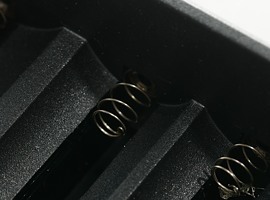 The problem with the current change point is easy to fix, simply stretch the springs a bit, but it would have been nice if it had been made correctly from the factory. The charger cannot be recommended for LiIon, but is fine for NiMH. 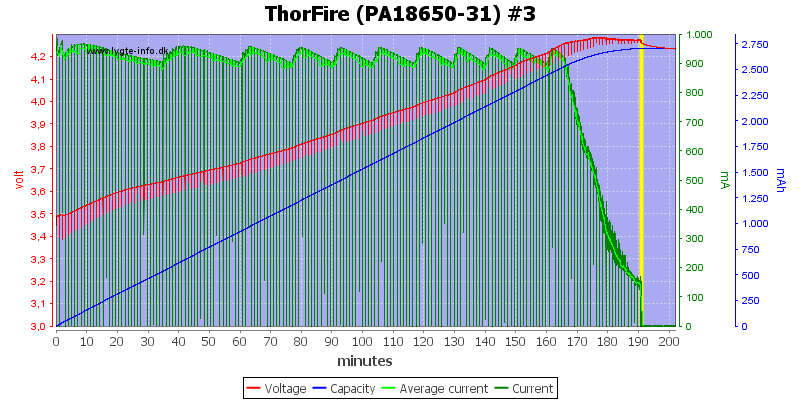 The charger was supplied by Eachine for a review.